Minors coming over the border are being sent to a huge tent camp in the desert near Tornillo, Texas. They are children seeking refuge, who should be given special rights because they have escaped from conflict zones. But this is how President Donald Trump’s administration treats Central American children. They arrive alone, mostly from Honduras, Guatemala or El Salvador. Not yet 18 years of age, they come to the United States to join their parents, siblings, uncles or distant relatives whom they hardly know. Having crossed though Mexico, they are exhausted. They risk being harmed by human traffickers, and if they are girls, that risk is higher. They have survived weeks, and sometimes months, of abuse, hunger and cold, while dreaming of a better life in America. But when these children arrive here, they are put behind bars, or in icy rooms, or in tents in the middle of the desert. And their idea of a friendly country — one that would welcome them with open arms and protect them from the violence and hunger they suffered back home — begins to erode. These migrant children are arriving at the southern U.S. border daily. They surrender at entry ports or cross the border illegally, then stand passively when border patrol agents come to collect them. Almost all have a relative’s phone number written on their hands or feet, on the sole of a shoe or their underpants, or engraved in their memories after having repeated it so many times. Last month, 12,800 migrant children were in U.S. custody, according to a report in The New York Times, a drastic increase from the 2,400-plus kids who were in custody in May 2017. These children had typically spent a couple months in shelters run by the Department of Health and Human Services, until they were placed with relatives or sponsors. But since Immigration and Customs Enforcement officials began using these children as bait, to lure undocumented parents and arrest them, fewer parents have been likely to come for them, or have taken much longer to do so. So many minor border crossers are in custody that there is less and less room available for them in shelters. 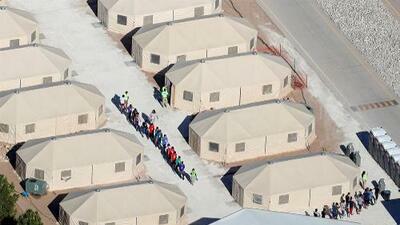 Now some are being sent to a huge tent camp in the desert near Tornillo, Texas. Up to 3,800 kids will be housed there, without schooling, recreation or legal assistance. Many of these children, according to reporting in the Times, are moved to these tents at night, without warning, to prevent them from running away. The beige-colored tents in Texas remind me of the tent city where the infamous Sheriff Joe Arpaio sent prisoners in Maricopa County, Arizona. Temperatures in this part of Texas range from suffocating heat during the day to freezing cold at night. Yes, the tents are air-conditioned, but they are nothing like summer camp, as some government officials claim. The government labels these children “unaccompanied minors,” as if they were flying somewhere on an airline by themselves. The euphemism conceals a cruel policy that is also a violation of their human rights. They are not just ordinary immigrants. They are children seeking refuge, who should be given special rights because they have escaped from conflict zones. But this is how President Donald Trump’s administration treats Central American children. The government places them in tents, alone, in the desert, or separates them from their parents after they’ve crossed the border, as was the case recently with over 2,500 children. The administration’s so-called zero tolerance policy led to the arrest of toddlers who could not communicate with their parents. And 136 still haven’t been reunited with them. This double standard is unbearable. What would happen if, suddenly, American kids were taken away from their parents after entering Mexico, Honduras, Guatemala or El Salvador? Can you imagine how the United States would react if neighboring countries put thousands of American children in tents, by themselves, for 50 or 60 days? Not long ago, near McAllen, Texas, I approached a 5-year-old Honduran boy who had been arrested along with his mother by Border Patrol agents. The boy was tired and scared. Naïvely, I asked him what his parents had told him about the United States before he left his home. “That it was very nice,” he told me, with a shy smile. This kid had no idea what awaited him.